This is a collaboration post featuring members of The Fangirl Initiative team. Today we're reviewing The Hobbit: The Battle of the Five Armies. SPOILERS. I may be a fan of the books first and foremost, but that has never stopped me from liking all the LOTR and Hobbit movies and this was no exception. While, of course, it didn't replicate it and changed some stuff, any excuse to see beautiful and picturesque Middle-Earth and to have more time there with characters who are played by such excellent actors is worth it to me. I thought Jackson did a beautiful job cinematography wise, and surprisingly, in character development. I wasn't a fan of so much of the movie being set during a battle (I mean, the battles can be awesome, but I also like changes of scenery/conversations sometimes, you know?) but I really appreciated that even so, and with such a big cast, there turned out to be a lot of room for getting to know each one of the characters. Thranduil and Legolas were fleshed out a bit more which I liked--the bit with Legolas' mother (a big mystery, since Tolkien originally didn't even intend to write Legolas, and only thought of him when he was writing the Council scene in FOTR) was well done, although somewhat abrupt. I think some transitions, from Thranduil forbidding Tauriel to love Kili, to saying that it was "real", were abrupt as well, but with so many characters and plots to fill out before the film ended, I like to give it the benefit of the doubt and imagine there were other scenes in which these characters had time to develop these things (and, if we really were in Middle-earth, the battle wouldn't have been shortened to cinematographical lengths, so there you go). Bard and his family got good development for the time slot, I thought, as did Kili and Tauriel. Bilbo was excellent and I thought Martin Freeman did again, a spectacular job, he was just born to play the role and was so convincing and natural--the few comic bits were nice as well as his interaction with Gandalf and the dwarves. All in all, a beautiful production. I was right to bring tissues and even though I knew what was going to happen--though still would have been actually glad to see Jackson change those parts--it was an emotional rollercoaster. From Fili's abrupt murder to the end scenes that tied it in with the LOTR films, I had tears streaming down my face. Scratch that, I was crying even more in the credits--the beautifully done, illustrated credits that featured Billy Boyd's amazing vocals--because time in Middle-earth was coming to an end... even with the extended editions, it's weird that most of Tolkien's main work has been produced into film and I've seen it all. I think with all of us fans, it's a sense of even though we can always reread and rewatch, which is sometimes just as rewarding--like meeting old friends again--it's sad to realise that it'll never be "new" and exciting in that way. But still, I find something new every time I return to Middle-earth in one way or another, so I hope all my fellow fans can as well! The Battle of the Five Armies rarely had a dull moment, as it started immediately with Smaug’s attack on Laketown. I was skeptical of a movie that had little to promise other than two battles that were supposed to stretch over two hours; the last few movie franchises that tried to deliver on such a promise found me bored half to death. But somehow, Peter Jackson managed to not only fulfill such a promise… but completed it so well that I hardly realized that it was happening. Only a few scattered moments that feel like video-game advertisements (including a Legolas stunt even more ridiculous than his barrel-hopping in the previous film, if that were possible) dampened the parade. The story, while strangely paced, was dynamic and was laced with just enough mild humor to keep us smiling throughout the screening. It showed us the peril of growing to love riches over relationships (which is ironic, coming from a movie split into a trilogy so as to increase its earnings). Every major quote and meaningful moment that I’d hoped to see from the book made its way into the screenplay, though each was usually altered a tad. And of course, all of that extra time given to New Line Cinema to display a mere third of the book allowed the plot to spread out. We finally saw the great armies meet one by one, and finally saw the final breaths of some beloved characters whose deaths in the books had been shrouded in mystery until now. The screenwriters did an incredible job of focusing on more of their characters: Elf and Dwarf and Man alike. We got to see the growth of people like Galadriel and even Bard’s son… but unfortunately, that meant the loss of some time with many other beloved characters. In fact, once our original company of Dwarves joined the battle, we only saw only four of them in the fray during the entire skirmish. The whimsy and adventure of the first two movies had hinged on the diverse company of fourteen that we got to meet: back in the goblin tunnels of the Misty Mountains alone, we got to see every Dwarf throw a punch or wield a blade with mastery. In this installment of the story, the lesser Dwarves — even Balin, master swordsman — were left behind so as to give more screen time to others. Still, for the most part it was screen time well spent. There were only a few arcs (namely those of Legolas and Thranduil) that felt rather forced. But in the end, those were all minor flaws. 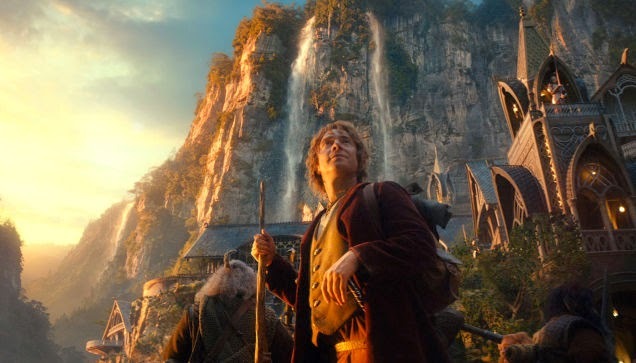 Every movie in the Hobbit series and even the Lord of the Rings trilogy have had their flaws, from incongruency with their source material to overuse of computer-generated effects. And yet those flaws aren’t the moments that we remember or cherish in the months and years that follow every film’s release. Our hearts still soar and ache with every step taken through Middle Earth, no matter who makes them. And I hope that in years to come, we will get to set foot in those fair lands once again. In the meantime, however, I do not mourn. These past three years have been three years more of adventure than I ever expected to have. Besides, the world is not in my books or films or drawings… it’s out there. Once something's falling, pushing on it with your foot will make it go down, and not you up. Case in point: the only other movie I ever saw with that stupid running-up-falling-rocks stunt was "Kung Fu Panda 2." How did Bard's son not get the side of his neck cut by the fletch of the black arrow? I have to admit, while a huge LOTR movie fan, I wasn’t a fan of The Hobbit trilogy overall. Even though I liked the book more than Lord of the Rings. The CGI made it look a bit too plastic and over the top for me. And while many of the important themes in the book were included in the film, I didn’t feel they were executed in a way that was effective. 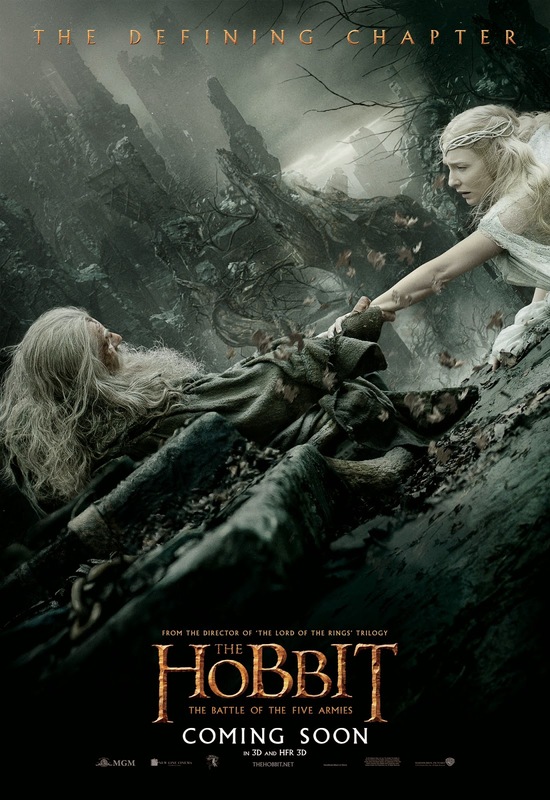 However, out of all the Hobbit films, I’d say I enjoyed this one the most. Martin Freeman was perfection as Bilbo, as always. And I was so happy that they included all the scenes involving him taking the Arkenstone from Thorin and giving it to Thranduil. That’s my absolute favorite scene from the book. Of course, you can’t get any more camp and fabulous than Thranduil. He’s always a joy to see. Lee Pace is fantastic. And what words are there for Richard Armitage as Thorin? I can only applaud. All in all, I might not be a Hobbit film fan. But I did enjoy the third film, and would say it’s the best of the three Hobbit movies. I’ll admit it: I hadn’t been a huge fan of The Hobbit trilogy. Ever since they turned my favorite parts of the book--the goblins--into blathering idiots, I’d been a little miffed. My mind was slightly changed by The Desolation of Smaug, which turned out to be a better (if sometimes implausible) film. I went to The Battle of the Five Armies with hopeful yet unsure expectations, and thankfully, I was not disappointed. The movie starts out with Smaug laying waste to Laketown. I had been annoyed that Smaug hadn’t destroyed much in the last movie, so this was quite a shock. “He isn’t really going to do that, is he?” I thought to myself. “He surely can’t destroy a town with hundreds of innocent people.” Yet he did. This gave us an exciting start to the movie, and it sucked me right in. I could barely contain myself, actually, as I sat in the dark theater. The movie was incredibly exciting. The death of Smaug happens a few minutes in, which confused me. What could possibly happen to fill up the entire movie? The entire movie isn’t going to be a battle is it? Surprisingly, it was. But I wasn’t bored. There were enough pauses and character-driven moments to fuel me. Some of the highlights: I really enjoyed Thorin’s cousin, the hilarious dwarf riding a goat into battle. I also really loved the moment when Thorin realizes what the gold is doing to him. While it was a bit of an abrupt change that seemed to come out of nowhere, I loved the visuals we saw of the gold almost drowning him. It reminded me of King Midas in an odd manner. I also really enjoyed Bard’s family. I couldn’t remember the book for sure, so I was almost positive that Bard was going to die and that’s why we saw so much of his children. But thankfully, Bard lived, and thank goodness for that. I fell ten times more in love with him during this movie. On a slightly different note, this movie managed to make me hate almost every main character, then love them again. Between Thorin’s sickness and Thranduil’s cold demeanor, I hated them. Then, when we saw their hearts, I loved them once again. I absolutely love it when stories do this. The emotion I felt is not limited just to hatred, however. This movie contained sorrow. I started crying when Thorin, Balin, Fili, and Kili went off on their own. I knew what was coming. I’d felt so heartwrenched in the book when I found out Thorin, Fili, and Kili had died, and that was only one sentence. How much more so in this movie? I watched the battle scenes with blurry eyes, and when the deaths actually happened, I cried harder. Even now, I feel a bit emotional. I’m a bit annoyed with Fili’s death; it seemed he was collateral damage, killed senselessly first. We barely got a chance to grieve Fili himself before we move on back to his brother. While I loved the screentime Kili got, Fili was my favorite dwarf. I was annoyed that we didn’t get to see much more of him. Kili’s and Thorin’s death were just as hard to stomach, as we see Tauriel’s reaction to Kili’s death, which is heartbreaking. (They barely had a chance. 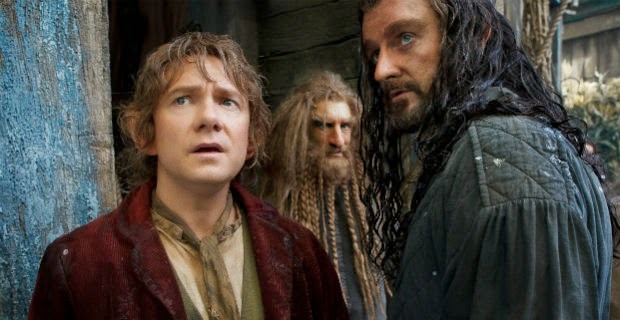 </3) We also see Bilbo by Thorin’s side. “The eagles are coming, Thorin,” he says. I’m pretty sure you could’ve heard every heart break in the theater. I loved Thranduil’s development in this movie. While I’ve hated him in the past, seeing his icy exterior finally break was amazing. I loved how he comforted Tauriel; that’s one of my favorite scenes of the movie to me. “Why does it hurt so much?” “Because it was real.” I also enjoyed Thranduil’s scene with Legolas, which is pretty much all the development for Legolas’ backstory we’ve ever gotten. While I felt the Aragorn name-drop was a little contrived, I still enjoyed the mention to one of my favorite characters. I didn’t stop crying even after the deaths. The last shot of the map of Middle-earth reminded me so much of reading The Hobbit as a young girl and studying that exact map in the back of my book. It was so personally touching to me. I couldn’t think of a better ending than one back at Bag-End with Bilbo, leaving us ready to start all over again sixty years later with The Lord of the Rings. As the credits played, I cried, too. Between Pippin’s voice, the beautifully illustrated credits, and the fact that this is possibly the last movie of Tolkien’s work I will ever see, I couldn’t hold back the tears. Middle-earth has been a home to me so many times, and I am incredibly thankful for this journey. “I will not say do not weep, for not all tears are an evil,” as Gandalf says. I’ve decided it’s okay to grieve because Tolkien’s work has, quite literally, meant the world to some of us. I can’t express how much I’ve been impacted by these movies, these characters, and this world. Thankfully, we have Middle-earth always, to welcome us back home. 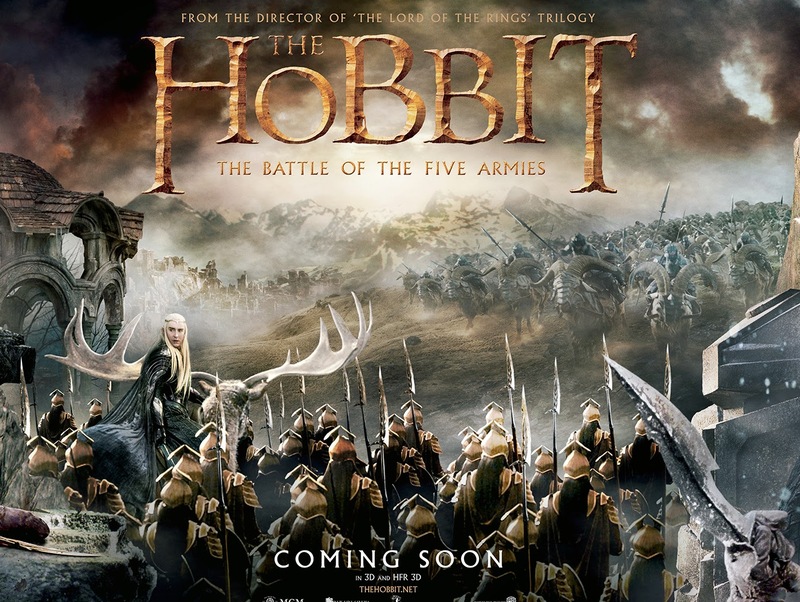 I cannot believe the wait for the Battle of the Five Armies is over! I’m still partly in shock that this was the last goodbye to Middle Earth on the silver screen, and so it’s hard to find the words to describe my feelings. The scenery and sets were stunning, as I’ve come to expect. Immediately, I was immersed in Middle Earth, and instead of sitting on a plush theater seat, I was fleeing Lake Town, walking through the halls of Erebor, and standing on the battlefield. The action completed the effect, and I would find myself holding my breath, clutching my seat and willing my favorite characters to victory. Speaking of characters, there was much to love about them here. 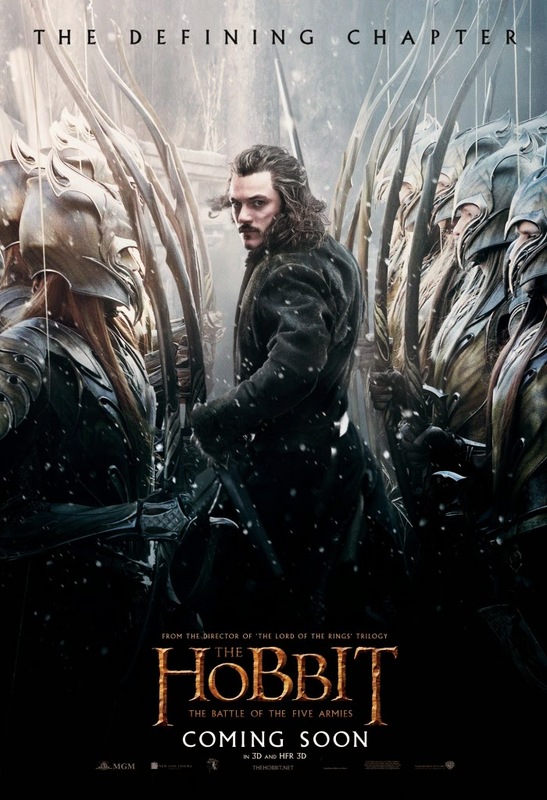 I greatly enjoyed the Elves’ presence in this, especially Legolas; Thorin’s instability and ultimate redemption were powerfully portrayed, as was the bravery and growth of Fili and Kili; and Bilbo is brilliant, the perfect blend of the spunky Shire hobbit and the brave fighter he’s become. Although I did absolutely love the film, there were a few things that didn’t entirely please me. Parts of the dialogue felt stilted, and some of the humor got in the way of the darker feel I was expecting. There were also some loose ends, such as what happened to the people of Lake Town, and I would have chosen a different fate for Tauriel. Overall, though, my few complaints don’t outweigh how captivating and unforgettable this movie was. The soundtrack is beautiful, and one of my favorite elements might be the artwork accompanying the credits. As soon as I walked out of the theater, I wanted to turn around and go watch the Battle of the Five Armies again. It was wonderful how the ending came full circle to the Fellowship of the Ring, and how touching BOFA was as a final farewell. How do I pick up the threads of an old life—a life before Middle Earth? How do I go on when in my heart I begin to understand there is no going back to the world I fell in love with? While I’ve been able to enjoy The Lord of the Rings movies from the comforts of my home (my armchair and books, as a hobbit would), The Hobbit movies were my chance to experience Middle Earth in theaters. I had been at the turning point for PG-13 movies for the release of The Lord of the Rings movies. I recall seeing The Two Towers and The Return of the King, but I wasn’t attached yet. I hadn’t read the books; I hadn’t fallen in love with Middle Earth. But now I have, and it’s over. 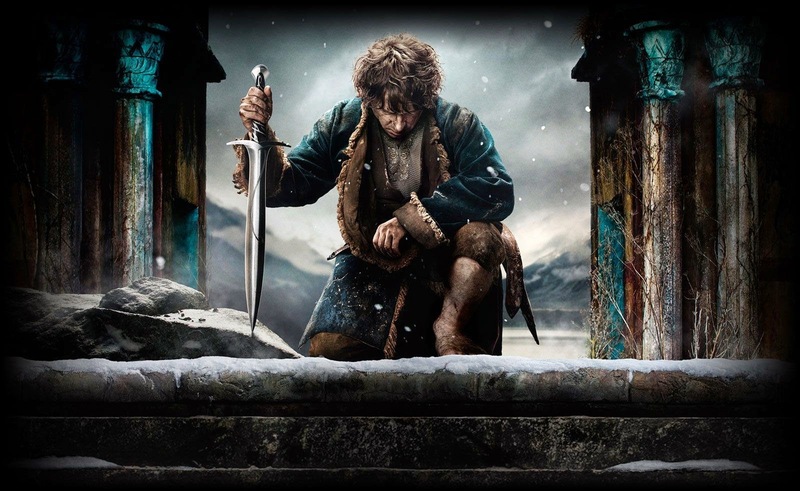 I watched The Hobbit: The Battle of Five Armies and bid my own “fond farewell” along with Billy Boyd’s lovely voice. And then you know what I did the next evening? I watched it again. I laughed. I cried. I cheered. I sighed. The movie is far from perfect, far from the accuracy my normal perfectionist self would want from a book-to-movie adaptation. But you know what I thought of the movie and what Peter Jackson did to adapt it, to add in exciting twists and subplots, to connect it to The Lord of the Rings trilogy? I loved it. I cherished it. I enjoyed it so much that upon seeing it for a third time, I was loving every moment again. It had its exciting moments where I wanted to shout, its intense moments where my heart cried out for the characters, and its mournful moments where I saw the last glimpse of life in characters I had fallen in love with. 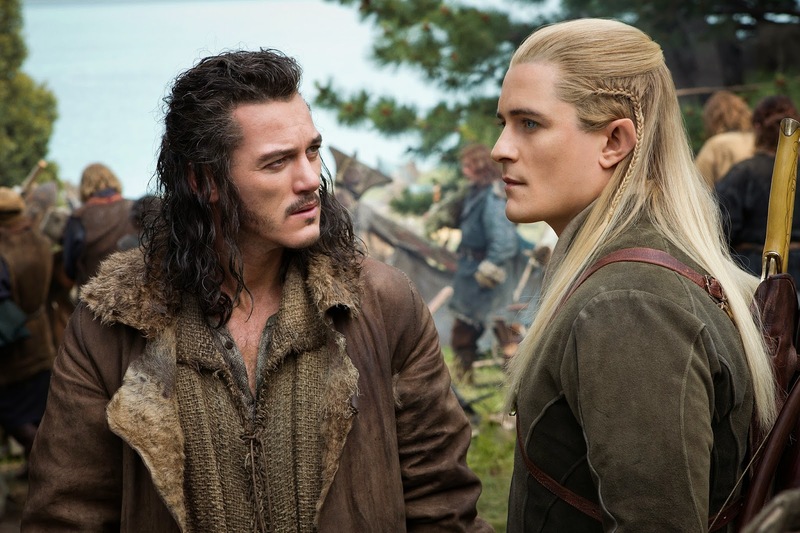 What did you think of The Hobbit: Battle of the Five Armies? So much truth here, but I have to say my fav line is "Videogame Legolas". That jumping across the falling stones bit ruined the tense atmosphere of the fight for me. I mean, if he could do that, what couldn't he survive? But overall, I did enjoy the film, and THE MUSIC. EEEEK.